Carl Froch produced one of the great comebacks to retain his WBC super-middleweight crown against Jermain Taylor in Mashantucket, Connecticut. Nottingham's Froch was well behind on two scorecards going into the 12th round but produced a grandstand finish to stop Taylor with seconds remaining. Froch had been outclassed for much of the fight and he went down for the first time in his career in the third. But an exhausted Taylor was unable to withstand Froch's furious late rally. "What I did in the 12th, that was unbelievable," Froch said. "I showed a little composure. I got up and knocked him out in round 12. What more do you want? "Coming into the last round, I was hoping my intuition was right and Jermain was tiring from dealing with my pressure. "I came out here to make a statement on American soil and I believe I made it." 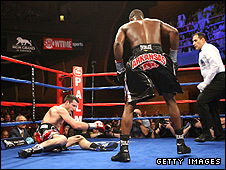 Taylor, who beat the great Bernard Hopkins twice in 2005, admitted he thought he had the fight won in the third. "I thought to myself 'I'll take my time and be smart'. I trained my hardest, he just stayed with it and he got it." The 31-year-old Froch, now unbeaten in 25 fights, was making the first defence of the title he won by defeating Canada's Jean Pascal in Nottingham last December. And in front of a partisan crowd at the MGM Grand Theater in Mashantucket, Froch, who has fought outside England only once before, looked very far from home in the early stages. Taylor, a former undisputed middleweight champion, looked far quicker than the champion in the opening two rounds, consistently beating Froch to the jab. The American then landed with a chopping right hand over Froch's low-slung left hand in round three, followed by an uppercut and a left hook which had Froch staggering. Taylor, fighting for only the second time at 168lb, landed with another big right before a snappy left-right combination sent Froch to the canvas with 40 seconds left on the clock. Froch rose on the count of eight, and although he did not seem badly hurt, Taylor continued to outbox him in the fourth and fifth, with Froch showing an alarming lack of urgency and having little success with his jab. After some strong words from his trainer Robert McCracken, Froch started jabbing more in the sixth, although Taylor may have nicked yet another round with two razor-sharp left-right combinations on the bell. And Taylor definitely took the seventh, the native of Little Rock, Arkansas spotting Froch's telegraphed right and peppering the Englishman with left hands. By round eight, Froch already looked like he needed a knockout and he managed to back Taylor up with a left-right combination. However, Taylor produced a boxing masterclass just before the bell, landing with a double left hook and a thunderous uppercut to leave Froch hanging on. Froch, cautious of getting too close for fear of Taylor's left hand, continued to be outclassed in round nine, with the American slipping and sliding Froch's sometimes crude attacks and often leaving his rival off-balance. And even though Taylor was clearly tiring in the 10th, it was only in the 11th that Froch's small band of fans had real reason to be optimistic as he hurt Taylor for perhaps the first time in the fight with a big right and a sweet uppercut. Going into the final round, two of the judges had the home fighter leading 106-102, and Taylor pressed home his advantage with a big right at the start of the round. But Froch came storming back, a booming right leaving the challenger on jelly legs and literally running away from his opponent. Froch hunted his man down and continued to pepper him with unanswered punches and Taylor finally crumpled in a neutral corner with 45 seconds left in the round. Taylor managed to haul himself to his feet, but Froch pinned him down in the opposite corner and after 15 unanswered blows, referee Mike Ortega rightly called a halt to proceedings with 14 seconds left. "If there was 14 seconds left or one second left it made no difference, he was defenceless," Ortega said. "I wanted him to be able to go home safely to his family." "I think the referee did the right thing," Froch said. "He was badly hurt. He was not even defending himself. His arms were dropping, I could have done what I wanted to him." Taylor, who did not dispute the referee's decision, said he would welcome a rematch, although Froch called out retired Welsh legend Joe Calzaghe after the fight. "If he gets out of his armchair I will show everybody what I can do," Froch said.